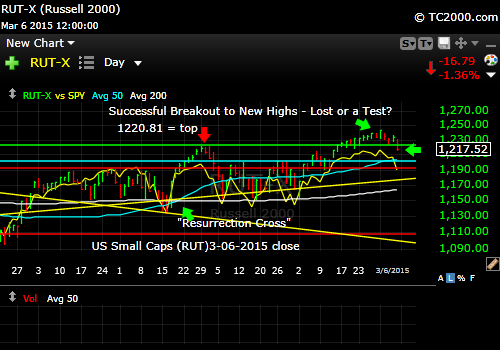 ← Market Timing Brief for the 2-27-2015 Close: SP500 Index Breakout Still Intact. Gold’s A Buy. Rates Should Move Down. Will They? 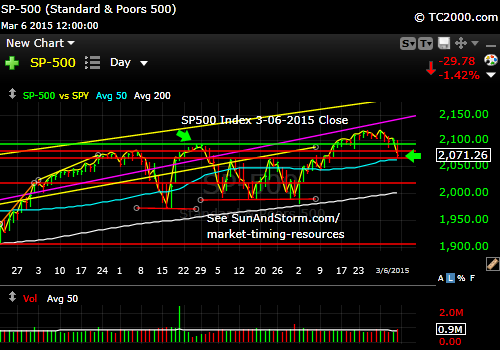 Market Timing Brief for the 3-06-2015 Close: SP500 Index Breakout Reversed. The Gold Trade Fails. Rates Rising On Fed Fears. I keep my comments brief to honor both my time and yours. The rest is on Twitter®/StockTwits®. 1. The world economy is slowing outside of the U.S.
2. The entire world other than the U.S. and the U.K. is planning more easing of monetary policy. 3. There is a fear that arose last week that the economic data in the U.S. is too strong, which will force the Fed to raise rates, perhaps more than “one and done.” If that happens, it provides competition for stocks for investors who want a safer return at higher rates than are available today. This would bring down stock and bond prices. That’s why they fell last week, but see the next section to understand why they are likely to rise again before they fall too far (does not preclude up to 10% corrections). 4. The slowdown abroad will keep the U.S. economy from expanding too rapidly and corporate profits are already lower due to dollar strength. 5. The Fed will raise rates marginally over 1-2 meetings and be done at about 0.5% off zero after one to two meetings due to the weakness of the world economy. 6. Eventually all the fuel added to the fire WILL work and there will be too much inflation despite the slow growth of the world economy. 7. Central banks will have to tighten to prevent prices from rising rapidly. The Fed’s mandate includes both employment and inflation, and it will be forced to act at a certain point. 8. Government fiscal policy will have to change because the Fed and other Central Banks will be powerless to stimulate the economy due to inflation. All they will be able to do is to fight the inflation they will eventually create. 9. The stock market will be in a slump for 5 years or more if nothing is done on the fiscal side or if innovation stalls over the next few years. Relying on Congress to get something done has not been a reliable investment thesis! 1. Rates will stay low for a while around the world including in the U.S. due to pressure of other foreign banks with zero to sub-zero rates. 2. This will fuel equity prices further. The rally will continue for a year or two here and abroad. The current correction should be no more than 10% and could be shallow in the U.S., as the U.S. economy is still growing. If Europe does not respond to ECB QE, those markets will suffer, but the expectation is that this will work as it did in the U.S. If you buy that, buy Europe. I’ve bought the U.K., because it should benefit from the ECB easing while not suffering a currency decline to the extent that the Euro has and will continue to sustain. HEDJ has worked well lately, but if the Fed is forced to stand aside, the dollar could take a hit. It might be smartest to be currency neutral by buying both a U.S. dollar hedged and a non-USD hedged Eurozone ETF. 3. Gold will maintain its value, but stays range bound for several years until inflation picks up again or the U.S. dollar is damaged by further Fed policy interventions such as QE. If gold breaks to new lows, I’d consider stepping aside until a bottom is formed again. If it holds the recent range, I’d keep some gold on board for a hedge against inflation. How about the very immediate term? The SPX has failed its prior breakout. I mentioned last week that we’d have to fall below the prior breakout at 2093.55 to void it. We did. Some were buying on Friday. They may be right for a day or two, but there is plenty of room for this pullback to continue. For example, we could bounce from around the 50 day moving average and then fail again. Breakout has failed. Will we recover it quickly or is this going to be a significant correction? To find out what I’m doing, including buys and sells, please follow me here: Follow Me on Twitter®. Follow Me on StockTwits® You don’t have to make comments yourself to read my messages. Small caps have failed their breakout as well. I mentioned last week that the valuation of the RUT is stretched almost to where it was a year ago (per Wall Street Journal stats). We need to fall further to bring valuations down to a more reasonable level perhaps, especially if the Fed raises rates too much. Gold has all but destroyed its rally. There is one more level of support below this at 109.67 and then an opportunity to go into free fall. It would seem with all the easing going on around the world, that this should not happen. It would seem that gold would be a good deal still under those circumstances. Sometimes the market has a different idea about what is happening than what the theory says. Use stops on your positions. Gold must hold the prior base or we’ll have another free fall. Please Click the TNX Chart to enlarge it (see related ETFs, TLT, TBT and UBT): Rates rose despite the downward pressure from abroad. It seems that the rise is unsustainable given that, but the TNX will have to reverse soon to prove it. 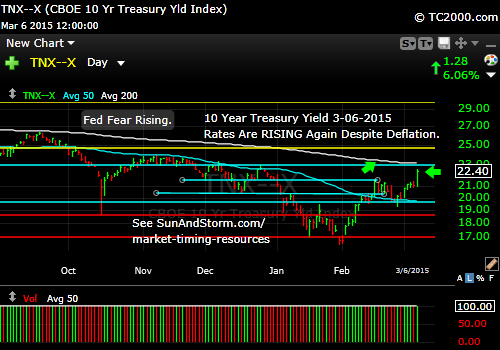 Perhaps it will happen at the 200 day moving average or the yellow resistance line shown. Rates rising again on Fed fear. CONCLUSIONS: The U.S. stock market breakouts were both lost. Even if we get a bounce here, there is a danger that the market has reset to the notion that the Fed is raising rates and that it will do so too aggressively. I don’t believe it can raise rates significantly, so I expect the equity markets to continue to do well in the short term despite 3% dips and 10% corrections this year. Buy the lows and sell some at the highs. 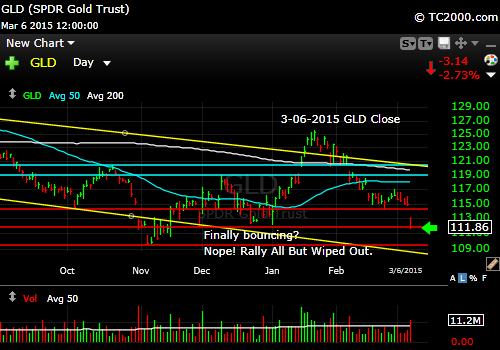 The gold entry from last week was a bust, but there is one last level of support, before another free fall begins. Make you nervous? That is the nature of markets and at times, they fall just below support to scare out the most weak hands before rising strongly. From last week, and this is still true in my opinion: “The recent Federal Reserve speeches are all aligned with a more dovish Fed policy despite their threat of moving the Fed Funds rate off zero.” That means rates will go lower again. From what level they fall is the issue we face in the near term. No one can answer that unfortunately. I cover foreign markets on social media (see links above) and in my montly newsletter. Note that the newsletter is now closed again to new subscriptions: Join the Wait List to Join the Newsletter as a Loyal Subscriber, Opening again for the April. 4th issue. If you join and don’t read the newsletter, you will be deleted. I don’t publish to non-readers as other newsletters do. Stay tuned here in the meantime and follow all the action via the Twitter® and StockTwits® links above. This entry was posted in Bonds, gold, investment, large cap stocks, S&P 500 Index, small cap stocks, Treasuries and tagged 10 year treasury, federal reserve, gld, gold etf, iwm, market timing, rut, sp500 index, spx, spy, tbt, tlt, tnx, ubt. Bookmark the permalink.